This is an important verse in this debate, quoted by both sides of the debate. Tawaffi has already been discussed in Proof 1. It clearly means death. The other word of significance here is rafa, which literally means ‘to raise’. Rafioka illayya, means ‘raise thee to Myself’. 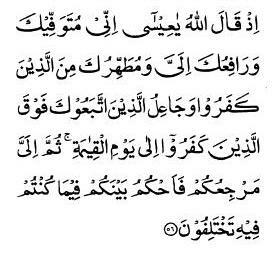 The beginning of this verse mention two acts of God, one in which He shall cause Jesus to die (mutawaffika), and the other where he shall raise Jesus to Himself (rafioka illayya). Whatever may be the meaning of rafioka illayya, one thing is certain that it comes after mutawaffika. Jesus will die before he is raised. Could this mean that Jesus has been physically raised to the heaven? Remember that this verse only talks of Jesus being raised towards God, which is quite contrary to being raised to the heaven. Let us explore a little bit as to what could ‘raising towards God’ may mean. For one, it cannot mean a physical ascension, such that the body of Jesus actually makes a movement in a certain direction. For Jesus to physically move in the direction of God, from point A to point B, requires a physical existence of God. Not only that, for point B to be distinct from point A, it requires that God be not present at point A, because only then does a move towards point B makes any sense. If God is present at all points in the Universe then it is impossible for Jesus to physically move in His direction. At best Jesus can be allowed to remain physically stationary. The alternative and more meaningful reading is that rafioka means elevation of spiritual rank. Moreover, since Jesus is alleged to have died on the cross, which according to the Old Testament is an accursed death (Deut 18:20; 21:22-23), Allah absolves him of that ignominy and adjudges his fate to have been exactly the opposite, a noble death and elevation of spiritual rank. Human brain is too small to understand Lord Jesus Christ. It is only by the grace of Holy Spirit that a person is able to realize the Jesus Christ. If you really want to know Jesus Christ read Holy Bible and then you will realize how short sighted was your logical reasoning. Well if your religion is to complicated for the human brain. Than i don't why do you believe in this religion. Islam is very simple. Believe in one god (Allah), believe in the holy book and of course believe in all prophets send by Allah including the last prophet Mohamed s.a.w . Maybe you are right the bible is to complicated because someone changed it. My friend I suggest you read the Holy book (Quran )of the one god (Allah) and you will see everything is very clear. For all human kind you can find forgiveness. why is it that muslims, mormons and jehova's witnesses have to justify their religious views by denouncing Christ? Mainly his deity and the fact he raised himself from the dead to prove it. we do not as christians have to print excessive literature or strap bombs to ourselves to get our point across. we simply present God's holy word. That God being the God of Abraham. The lord God, Jesus Christ. One God performing three functions. Actually Holy Quran is the confirmation book of Jesus christ and holy bible but most of the so called muslims and christians just follow their own conjectures and definitely on the day of judgement Allah will clarify where we all are differing with each other. According to Holy Quran Jesus pbuh died natural death and in verse Allah s.w.t had said he will talk in old age also. This means he was given some place on earth to stay as a refugee and in course completed his normal life and died. That what is in Quran if one wants to find the simple truth otherwise there is time enough in this world to fight with each other for something we dont know what we are fighting for. Even muslims most of them like christians dont believe in the reality of the Allah's saying and they too with this christians will be in hell for disbelieving the word of the Great lord. And for ur all information the true and complete bible was given to nasraani's not the roman catholic as they are thinking of the guardianship of christian's faith. And this so called muslims also will be taken to task for following the wrong book of hadith which Allah s.w.t never ordain them to read or to see or to follow.